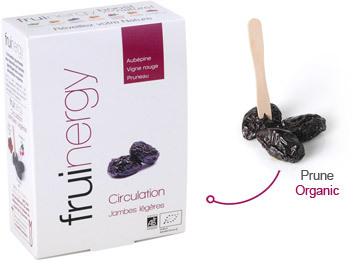 fruinergy Circulation Peppy Legs deliciously combines prune with plants traditionally used for their potential to stimulate a good circulation. Hawthorn (Crataegus laevigata) is good to increase oxygen blood flow. As Red Vine (Vitis vinifera), it improves the circulatory functions and helps recovering the feeling of peppy legs. fruinergy Circulation Peppy Legs is low in sodium and rich in potassium, thus contributing to maintaining a normal blood pressure. fruinergy Peppy Legs is made with environmentally friendly techniques. Its carefully selected ingredients add up to a high quality product with authentic taste.